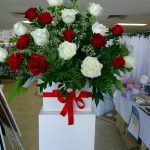 Traditional style church arrangement in fresh red and white roses with baby’s breath. 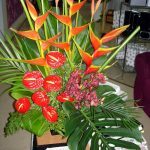 Large, modern, tropical church arrangement of heliconia, anthurium and vanda orchids and tropical foliage. Approximate dimensions 60cm tall, 60cm wide. 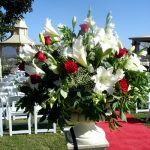 Traditional style small urn with pedestal featuring fresh roses, lilies and gladioli. 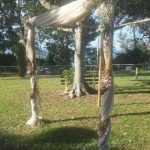 Vintage arbour with draped vintage material and fresh ivy, baby breath and jasmine vine. 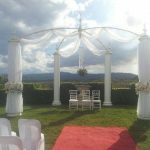 Vintage wedding ceremony setting featuring our rustic window and French door frame adorned with fresh flowers and white Americana chairs with matching fresh flower pew arrangements. 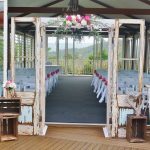 Wooden crates with fresh flowers and ‘Welcome to our Wedding’ chalkboard sign complete this look. Please contact us for more details on the package price.